Another smaller update, this time it's just one mini actually, but a speshul one - it's Shadow Captain Korvydae! Cool model. Quite the attitude and quite the hammer. 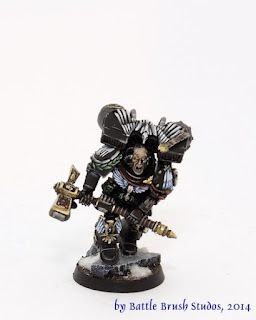 I tried to keep the palette very restrained, as on all Raven Guard I paint for this project. Bit more gold because he's a captain after all, but it's all kept rather sombre. Hope you like the fella!